There is a drastic change in the lifestyle of the people. More and more people are changing their diet choices and are willing to accept the new trends. The recent trend that is rising up is the trend of veganism. This is the most accepted vegan milk among the mass. The taste is delicious and it gives you the fee of coconuts. It is highly nutritious. Wondering how? It contains minerals such as manganese, selenium, iron, zinc and copper. These are the essential components required for a better health. It is low in calories and can help you in your weight loss process. Though, the calcium level in coconut milk is slightly low when compared to dairy milk, yet it can prove beneficial to the health. It is highly nutritious and can be best your choice in the vegan milk category. The fats present in the almond milk are Omega-6 fats which are healthy to the body. It also controls the cholesterol levels. If you are looking for a product that can help you to age gracefully, almond milk can be your best buddy. It contains Vitamin E which fights with the free radicals to make your skin look younger. It contains 30 calories per serving which makes it suitable for weight loss process as well. It might fall in the category of vegan milk, however the taste is quite similar to the regular milk. This is one reason that makes it the most opted vegan milk by the families. It contains potassium, selenium, thiamin, magnesium, choline and other such important components in the body. It is made out of edamame and is rich in proteins and calcium. If you are allergic to soy products, refrain yourself from the consumption of soy milk. Hemp milk is sourced from the seeds of hemp plant. It is mostly recommended for athletes and bodybuilders as they need more energy to sustain the workouts. Hemp milk is a blend of ten amino acids which makes it the power house of proteins. It is also rich in vitamins and minerals. It has calcium, niacin, fibre, potassium, thiamin and omega-3 fatty acids. Hemp milk can be consumed on regular basis to fetch the results faster. Sounds weird, isn’t it? Yes, it does exist! Rice milk is free of gluten which is a major ingredient found in most of the foods. People who are allergic to gluten can opt for rice milk. It is a rich source of proteins and carbohydrates which are both required for the body. The fat content in the rice milk is very low and this makes it health friendly. It is low in calories compared to the other vegan milk and can be used during the weight loss process. You might find it slightly watery, however you will like the taste of it. As rice is widely grown in India, the prices of rice milk is also economical. Hope this article had been useful to you. 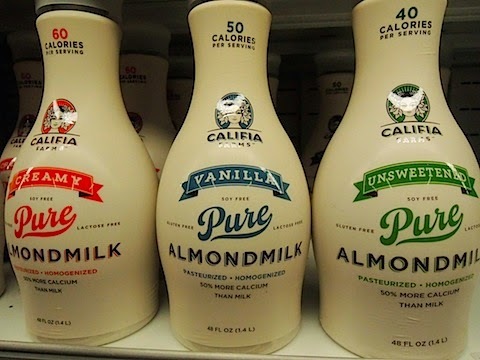 If you are planning to turn vegan and are looking for alternatives in the milk category, the above mentioned products will definitely suffice your purpose. Do start with the vegan milk and reap the benefits out of it. Share your experience with us and let us know your take on the vegan milk.